Was last month warm where you live? If so, you weren’t alone. According measurements taken by the National Oceanic and Atmospheric Administration (NOAA) June 2010 was the hottest June on record worldwide. But this is not a new trend, at least for this year. March, April, and May 2010 were also the warmest on record. This was also the 304th consecutive month with a global temperature above the 20th century average. The last month with below-average temperature was February 1985. * It was the warmest April–June (three-month period) on record for the global land and ocean temperature and the land-only temperature. The three-month period was the second warmest for the world’s oceans, behind 1998. * Sea surface temperature (SST) anomalies in the central and eastern equatorial Pacific Ocean continued to decrease during June 2010. According to NOAA’s Climate Prediction Center, La Niña conditions are likely to develop during the Northern Hemisphere summer 2010. Some regions on the planet, however, had cool temps for a northern hemisphere summer. Spain had its coolest June temperatures since 1997, and Guizhou in southern China had its coolest June since their records began in 1951. Still, with those cool temperatures, the planet on the whole was warmer. Other satellite data from the US National Snow and Ice Data Center in Colorado shows that the extent of sea ice in the Arctic was at its lowest for any June since satellite records started in 1979. 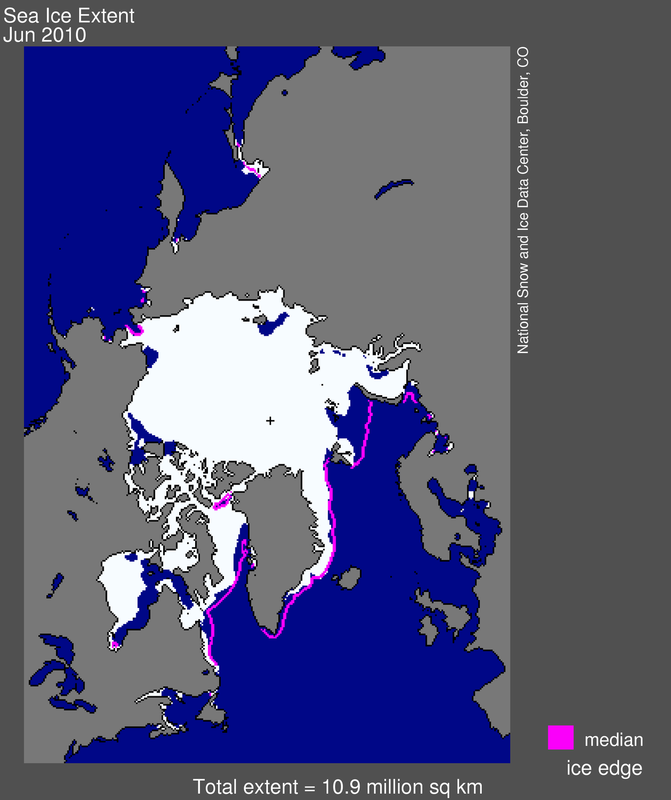 The ice cover on Arctic Ocean grows each winter and shrinks in summer, reaching its annual low point in September. The monthly average for June 2010 was 10.87 km sq. The ice was declining an average of 88,000 sq km per day in June. This rate of decline is the fastest measured for June. As the Arctic permafrost continues to melt and release gigatons of Methane trapped below that ancient layer, Global Warming and ‘odd’ weather conditions will no doubt accelerate. Methane is 20X worse (stronger) than CO2 as a greenhouse gas. Should deep ocean waters continue to warm, there is a very real possibility that multi-gigatons of frozen Methane Hydrates will melt and also be released into the atmosphere. Of course this is the worst case scenario.. but never-the-less more a possibility today than ever! That is a dangerous word the article used. “anomaly” Conspiracy theorists love that word. Hydrate and permafrost melt is the big problem we face. If this releases enough methane it will run away on us. We are in a lot of trouble, for it is hard to see how we can really make reductions in CO_2 output fast enough to prevent this from taking place. I expect the righwing types to be all over this site with their nonsense pretty quickly. Though here I think it is extremes. And it is amazing how AGW attribution science has strengthened since IPCC 4 (-07). This year a paper came out showing precisely that such extremes, among other weather characteristics down to continental scales or smaller, nowadays can be attributed consistently (i.e. with all natural sized parameters) and robustly (now with 2 sigma certainty). IPCC 4, which main strength lay in -01-07 period new data, had a 80 % certainty. (And a mere 60 % quorum on the 20 000 model runs it integrated.) In 4 years, say, it has increased to 95 %. I run a probit estimate, and I get that it is even odds that next IPCC (-14) will have 3 sigma certainty. I.e. from about “medical diagnosis” (60-80 %) to “physics certainty” in a mere decade. Man, the global fever is exploding that thermometer! The recent ‘Deep Horizon’ oil well explosion in the Gulf, may have been the result of puncturing a large pocket of Methane Hydrate. The subsequent rapid gas expansion due to contact with a relatively warm drill string and ‘drilling mud’ may have been the ‘trigger’? Released explosive gases then traveled up the drill string and with a simple spark – KAHBOOM! Evidence of massive underwater landslides in the Atlantic, off the continental shelf of the East Coast, are theorized to have been caused by sea level retreat during the last Ice Age exposing Methane Hydrate layers to warmer waters. Bubble bubble, toil and trouble..
I’m not a science guy like many of the other readers here, and I don’t care to take sides on the climate change debate. All I know is what I’ve experienced over the years here in Canada. It seems as each year goes by, it gets hotter overall. Even factoring in for how memory plays tricks on us as time goes by, It feels hotter – a lot hotter! Last winter was more like an extended fall. Temperatures rarely dived below zero. There were a couple days in December to February where I WALKED OUTSIDE IN SHORTS. If you know anything about Canadian winters, this is unheard of – yet there I was.I understand that these may have been freak weather events, and don’t bear a relationship to climatic averages. Nevertheless, the fact that they even happened – and more than once! – is just incredible! To Aqua. There is no evidence that the Gulf of Mexico spill is anything other than an accident due to poor maintenance. The Gulf experiences seepage from oil deposits close to the sea bed. This happens ALL over the world. In fact it was this is how oil was ‘discovered in Persia just over a hundred years ago. The ocean landslides generally occur in the deep, cold areas and are far more likely to bury the hydrates than expose them to warmer water. The temperature of the ultra deep ocean doesn’t really change much whether we’re in a glacial or inter-glacial period. If I remember correctly the global temperature has to rise to around 10-15 degrees higher than today for all the ocean hydrates to release methane and that last happened on a world-wide scale around the middle Cretaceous. Aqua, as Paul Eaton-Jones says. There was a dumb internet wave with that theme a few days back, and skeptics as well as overs had a good laugh and a sound head shake over the antics. Remember: hoof beats; think horses, not zebras. When Frozen Methane starts to melt, you know what we need to do right? Let it burn baby burn! Did they publish their exact measuring points? With all the deceptive at best science and massive amounts of money in this debate I want more info these days to make my own conclusions. I’m not so sure about this data. I remember much warmer temperatures in June when I was a kid. We often went over 100 F for days in a row, and we would go without rain for some time as well. This June, we haven’t gone over 100 F at all, and we’ve had above average rainfall. Also this spring was wetter and cooler than it has been in years. As for the winter… we had at least one inch of snow on the grown for over 4 months. Something which I never remember. That also means we were below freezing much of the time. Take this data as you will. Anyone who has taken advance probability courses will tell you there is more than one way to skew results in your favor. Perhaps there wasn’t as many extreme movements as there used to be, which will offset records….who knows. All I know, is what I’ve experienced… versus what they believe has happened. This doesn’t mean I don’t think there isn’t global warming… there is no doubt some parts are warmer than they have been for years. However, I think they are exagerating some areas which haven’t experienced warming. They are saying my area has been warmer this year, when it really hasn’t. This is why science uses real measured data instead of memories. I also remember warmer days, even colder days and wet days, and windy days and stormy days and snowy days. The human mind is easily tricked into ignoring the other parts that does not support their findings. The question is how many days in a row did you remember being warm in a decade period of time? Well we had over 17″ of snow (12″ one day) last winter in dallas Texas. That is quite an anomoly. Kids loved it. To Aodhhan. Climate change doesn’t necessarily mean that everywhere gets hotter [or colder] at the same time. Any increase or decrease in temperature will initially affect wind/rain patterns resulting in more/less rain or snow at any given area. So you may well have seen more snow or cooler temperatures than you did a few years ago. That isn’t to say the climate isn’t changing and getting warmer.While the earth is waiting for temperatures to reach some kind of equilibrium there will be a temperature gradient causing stronger winds [ in effect]. Once the polar regions are free of ice and the difference in tepmeratures narrows winds drop to gentle breezes and rainfall is limited to coastal belts. This is an oversimplification but again we can find evidence of this around 75-85 Mya. While I personally am not 100% convinced that the recent rise in temperatures is caused entirely by human activity [it overlies the rise caused by the earth’s emergence from the last Ice Age] there is a growing need to find ways of capturing CO2 and some of the more recent ideas seem to be the way out of the situation Merely cutting back on industrialisation is a very short-sighted [non] answer. And before the usual suspects jump all over me I am not a rabid right wing American petro-industrialist. I’m aware what it means. Apparently you didn’t read what I was saying. I stated they are claiming data in my location which isn’t true. Reread… I stated I know some areas are warmer. Many inidividuals tend to skew results a bit, since they don’t want to stop something they worked a long time at. “Border areas” are likely to be skewed in favor of the author. So basically, the blue areas probably should be a bit larger than shown. Many days at a time. I remember one Summer where we had to limit the use of water. Playing ball on hard, dead, yellow grass isn’t a lot of fun. I don’t consider myself Right Wing, but I do consider myself Conservative, and by that I mean we should conserve financially and environmentally. I do think the Earth is naturally warming, but I also believe we are adding to the effect. Greenhouse gases are a big problem, but I think the bigger threat is deforestation. Trees remove CO2 from the air and provide O2. Considering the amount of deforestation that has gone on all over the world, it’s no surprise CO2 levels are up. Add the additional CO2 and other greenhouse gases being dumped into the atmosphere, and we only make the problem worse. Honestly, I think the damage has already been done, and it’s too late to keep the global changes from happening, but maybe we can minimize it as much as possible. True – while there has been a slow rise toward increasing global temperatures, the rate of increasing temperatures is slowing. And while the CO2 concentrations are high, globally the CO2 concentrations have yet to go above 393 ppm. Not sure where you are getting your information, but it is incorrect as a marker for global data. Considering by the mid 1980s, when the global CO2 concentration went above 350 ppm, the global temperature was able to maintain its first significant rise in temperature of avg. 0.35C variation in the 20th century. The next plateau of avg. 0.55C variation was reached in the 1990s, when the CO2 concentrations went over 360 ppm. However, while the CO2 concentration has peaked just above 392 ppm for 2010, the temperature variations has slowed to an avg. 0.65C for about the last 15 years. While this does make it the warmest six month (per previous years) so far (I guess since the Little Ice Age anyway), the trend is now towards a stalling rate of temperature increase rather than a rising rate. However, while the CO2 concentration has risen to approximately 392+ ppm (25% higher than previously recorded in Vostok Station ice cores), the rate of increased temperature variation has slowed to an annual average rise of about +0.0165C (June – global combined ocean & land surface temperature), fluctuating from +0.4C to +0.77C, for the last 15 years. This fluctuation does not represent consecutively warmer years, but rather a random scattering of warmer and cooler years. Point being that the rate of the global temperature increase in the 21th century has slowed down in comparison to previously steeper rises prior to the 20th. This is not consistent with the every increasing rate of CO2 concentration. It appears that after the CO2 concentration became greater than 300 ppm to 350 ppm, the rate of increasing temperature actually decreased. Where is the drastic increase in temperature proportional to the increased concentrations of CO2? As this is not consistent with the expected AGW model of increasing temperatures relative to increasing CO2 concentrations, I believe we need a new model to tell us what is really going on. @sjbauer: And what are the numbers for Methane gas? Having just looked at the You Tube clip on methane hydrates I felt I was looking at a trailer for the 2012 film! The guy predicting the methane explosions etc is a chemical engineer not a geologist. The permain Extinction Event is generally considered to be the result of oceanic anoxia in the deeps, gross acidification in the upper parts of the ocean and raised CO2 in the atmosphere. Not rteally convincing I’m afraid. It’s the same with the whole climate change debate – the climate modellers have led the argument and come to radically different answers than meteorologists and geologists. Climate modelling really is the prime example of the Butterfly Effect. Even some modellers come up with zero temperature rise to a drop in temp. You makes your choice and takes your pick. The rise in global temperatures has slowed this last decade, but this is in keeping with a multidecade long oscillation in temperatures. During a warm period in this cycle in the 1990s heating of the climate surged forwards, while in this past decade which was a cooling period the evidence for global warming attenuated. Lawrence – I can not tell what you are trying to propose in the way of the current climatic condition. Are you saying that you believe in AGW and that a mere cooling period was enough to offset the dramatic rise in CO2 concentrations to 393 ppm, 20% higher than previously recorded in ice core data? OR are you saying that you believe that the primary driver of climate change is the glacial-interglacial cycles and that the planet has already entered the cooling period. Per past data, if the planet has already entered the cooling period, then eventually the CO2 concentrations will fall back in line with the decreasing temperature. Aqua – There is an alternate site for greenhouse gas concentrations, updated as of 2009, that presents an almost current value for methane gas concentrations of between 1865 and 1741 ppb. ( Ref – http://cdiac.ornl.gov/pns/current_ghg.html ). I would have to fish around for a more current number. Why do you ask ? It is pretty clear that we are a driver of heating up the atmosphere of the planet. So the average trend is warming. However there is a 30 year warm-cool cycle as well, which has been documented. We have been in what would be the cooler phase of that cycle, so that has ameliorated the CO_2 warming some. The problem is that now we will be heading into the warmer phase of that cycle and we may see AGWarming come at us pretty seriously here. Actually, because you buy into it doesn’t make it so. And because the initial IPCC study based there faith in the short-term data to represent a case for their AGW model, does not represent the final word on climate change. It is pretty clear that you dismiss the fact that there is an overriding 100,000 year glacial-interglacial cycle that has yet to peak. With NOAA data present to demonstrate a slowing of the rate of increasing temperature with a quickening rate of increasing CO2 concentration, you are convinced to pass it off as an anomaly because it is contrary to the projections of the AGW model. There is no such evidence to support a cyclic 30 year warming cycle. There is evidence of a quickening rate of warming in the last 2 decades of the 20th century. And there is evidence of a decreased rate of warming during the last decade. The warming trend is just as easily applied to the 100,000 glacial-interglacial cycle (in which there is evidence of its cyclic nature). You can continue with your support of AGW in spite of contrary evidence, but it’s not clear at all. Evidence more suggests that AGW is not the primary driver of global warming, but just a minor contributer. I read up on the climate issue from AAAS, PNAC and others. I am not an expert on the subject, but I do have to respect the findings which are reported in reputable and peer reviewed scientific publications. Further, the arguments I have read from these sources, usually I admit from review articles and not technically detailed research articles, appear cogent and reasonable. So I have to go on that basis. The counterclaims you are making generally don’t jibe with what I tend to read. Such counter claims seem to multiply like bunnies, and they are eventually killed off — only to gestate one more time. Largely the scientific debate on this has concluded, and research is focused more on refinements of AGW. The anti-AGW front is assuming a form similar to the creationists who try to maintain their is a controversy for media and public consumption. Lawrence – As you may have noticed, I am not so much anti-AGW, but I do believe it takes undue credit for the natural rise in temperature consistent with the glacil-interglacial cycles. And while I have successfully debated my point (including debunking your statement of a 30 year cycle), you are comfortable retreating to the carefully crafted IPCC study based on relatively short term climate data. Then the last word is yours, for now, as only time will either prove or disprove the AGW model as the primary driver of global warming. However you’ll note of the glacial-interglacial cycle from the past 650,000 of ice core data demonstrates that global cooling will be initiated despite high concentrations of greenhouse gases. Your analogy between anti-AGW as similar to creationists is inappropriate because anti-AGW supporters rely heavily on scientific data. However, I do see a vague similarity between AGW supporters and creationsists because the both tend to believe their cause regardless of continued scientific evidence that does not support their perspectives. If you have any contact with the real science it is pretty clear that there really is no controversy. The scientific verdict is pretty much 90% determined right now. I know this is contrary to what you see. However, in our modern age with the “marvel” of vast communications it has turned out that much of this is crap, and news outlets blend punditry and opinion with news to generate the appearance of things. The result is that largely the world is far more confused and in a fog of disinformation these days than in the past. To be honest it might not really matter that much. From what I see our goose might be already cooked, for I have a hard time seeing how we can really adjust our energy based economy to avoid the worst of climate heating. The Tea-Party wingnuts stand a chance of running the show by 2013, where we might elect as President a certain ditsy woman who believes there has to be a global nuclear war to bring Jesus back. The words which might be said, “Here you go President Palin, these are the nuclear launch codes” should strike terror in us all. Certainly by 2016 the far right will put the kibosh on any climate legislation, and so it might not really matter at all what anyone thinks. Oh well, I live in a nation of dumb people, and getting dumber. In case people think the idea of the release of methane is “new” they should consider that it is one of the more popular theories describing the scenario of events that produced the Permian-Traissic boundary mass extinction event. The geological and paleontological evidence from the field and carbon isotope signatures in rocks across the boundary suggest catastrophic release of methane produced an environment that led directly to an extinction event where in excess of 90% of species went extinct very rapidly. Similar scenarios are indicated for the Paleocene -Eocene boundary in the scientific literature, where although the magnitude of the extinction is event is smaller, the same basic cause is ascribed. The past is the key to the future and a warning to us all that when a tipping point on climate warming is passed, positive feedback mechanisms can come on board to produce disaster. Not only is the comment that climate change questioners are on a par with creationists inappropriate it is highly offensive and very dangerous. As I’ve said here before there is an increasing viciousness amongst the pro-AGW faction. In Britain there is a movement within the fascist left/green movement to have sceptics/questioners hauled before the courts and prosecuted under the crimes against humanity laws. The attempted stiffling of debate [any debate] about the root causes of climate change, as exemplified by some contributors here, is indicative of a fascistic, totalitarian mindset and a refusal to enter into a proper scientific debate. Where is the much-vaunted open-minded scientific method of investigation and an even-handed approach to study? @ Paul Eaton-Jones: There really is no scientific debate, any more than there is a scientific debate over whether tobacco causes cancer or between evolution and creationism. There is a social controversy, but this is not a scientific one. As with the tobacco case, the Tobacco Institute continued to release its “research” which refuted health links to smoking, but this was a disinformation campaign, not science in a proper sense. The AGW issue is following a similar path, where anti-AGW front is being held up more and more by so called think tanks, many arrayed around the Washington DC beltway. These organizations have political and economic agendas that are troubled by climate science. These organizations support corporate and financial interests, and so it is their mission to try to concoct something which appears as science to counter any environmental concern, including AGW. The problem is that just with the case of the Tobacco Institute this results in a delay in any action. With the case of smoking this protected the profits of the tobacco companies while it also fostered the death of millions, and in the case of AGW it protects the profits of fossil fuel corporations and delays our ability to really grapple with this problem. This could be seen in a way as criminal, for at least from what might be called the “spirit of the law,” this is damnable and appalling. I don’t think that there should be a thought police on this issue, and people are certainly free as individuals to believe anything they want —- whether that is anti-AGW or that the Earth is flat. Yet in the United States it is unfortunate how these types of disinformation campaigns work, and how whole media, PR and advertising industries can be brought to bear to promote mendacities. One result is that American people are amongst the most confused and ignorant populations of people in any technically advanced nation. I have to disagree with LBC. It is not only the ‘layman’ who is castigated and censored but any scientist who dares to question the received orthodoxy. ‘AGW’ as a ‘science’ is barely 20 years old yet already it has become entrenched and perceived as an truth absoolute and must not under any circumstances be questioned. ‘AGW’ is a separate issue from climate change which very few if any challenge. Trying to divorce the effects of ‘AGW’ from a totally natural occurance is the problem and hasn’t been properly addressed. There has been an unscientific rush to blame ‘nasty, rapacious’ humans. Some here may be too young to remember that a mere 35 years ago we were warned that within a generation climate change would radically alter the face of the planet due to the oncoming Ice Age. As the Americans say, “Go figure”. It is fair to say we know a whole lot more about this science than we did 25 years ago. The science of CO_2 induced global warming is more than 100 years old and started with Arrhenius. He proposed the hypothesis that humans would change climate by burning up stocks of coal back in 1898 or so. I am not a climatologist, so I have to go with what I can understand from those who work in the field. It is similar to the diagnosis of a doctor, I might get a second opinion but if after several similar outcomes I suspect the diagnosis is probably correct. The global warming science is at about the same stage. There are is a minority of holdouts in the climate science field, just as there are a few holdouts who insist the big bang is wrong. However, the tide turned in favor of the big bang in the 1960s and similarly the tide shifted for AGW in the 1990s. Eventually the holdouts retire and the next generation brought into the field ignore the previous holdouts. It’s not ‘a minority of holdouts’ that are concerned about the way the data is interpreted or the way they questioners are marginalised. In the final draft of the 2005[?] IPCC report the majority of the contributors withdrew their names. These scientists were meteorologists, atmospheric physicists, geologists, physists, geo-chemists. They felt the data was not representative that their theories hadn’t been included or severely watered down and skewed to ‘promote’ the influence of AGW and “that modellers had had too much input” [my quote]. The final draft was still published to great hurrahs. With luck once the current questioners retire they will be replaced by others who are not afraid to stand up and question – NOT deny but ignore – the political pressures and question the relatively small, as in historically short time, amount of evidence for AGW [a terrible phrase by the way]. As I think I’ve said previously virtually nobody now questions the changing climate just the basic, underlying cause[s]. In the part of Briatin where I currently live, east Yorkshire, the erosion of the cliffs is quite rapid but the underlying cause in isostatic readjustment/rebound following the retreat of the ice sheets 10,000 years ago yet nearly all the environmental agencies charged with trying ot protect the hinterland insist on saying ‘it’s global warming that’s doing it’. They conveniently ignore that east coast cliffs villages and even towns have been lost and submerged over the past 1500 years and are well documented. On the west coast of Britain [vast] tracts of land have emerged from the sea over a similar though not exacly the same timescale. Global drying anyone? ?